"This latest instalment in the 'Long Gone Sound' series features some of the rarest, most compelling tunes and heart-breaking songs from South-West Louisiana. 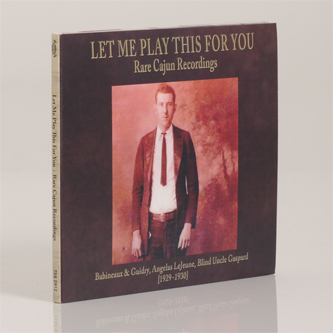 Most of the performances on this collection have not been heard since they were originally recorded on 78 rpm disc and yet they serve as a discrete Rosetta Stone for the traditional Cajun and Creole repertoire that exists today. 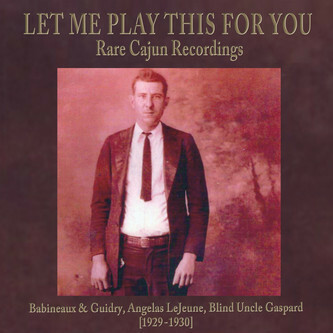 Not to be understated, this collection features some of the most vexingly rare & valuable Cajun 78s ever recorded. Cajun discs such as those found in this release are valued not only for their magnificent artistry but also because of their desperate scarcity. In the isolated back-water bayous & prairies of South-West Louisiana a profoundly unique and powerful form of indigenous music developed among the French speaking white Cajuns and black Creoles. Drawing from a rich range of cultural sounds, this music was first recorded in the 1920s & 1930s and featured such luminaries as Amede Ardoin, Dennis McGee and Joe & Cleoma Falcon. This special collection includes all of Percy Babineaux & Bixy Guidry's 1929 recordings and most of Angelas Le Jeune's 1929-1930 recordings with Denus McGee & Ernest Fruge. Found within is also the newly "discovered" 78 of Blind Uncle Gaspard & Delma Lachney. Respectfully crafted by Christopher King, Susan Archie & Ron Brown for Tompkins Square."